1. Ghana replicated the Ivory Coast’s tendency to rely on opposition mistakes and set-pieces to get their goals. Forcing errors in the opposition is a large part of attacking, and dead ball situations make up a high percentage of goals at any level of football. But the dependency on those two avenues is a damning indictment of the lack of creativity in the two sides considered to the best in the tournament. A final between the two is probable, but it could turn into a defensive stand-off. 2. 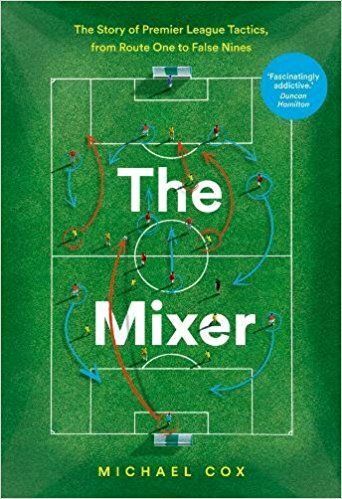 Tunisia started with a 4-3-1-2 formation, but more like the interpretation of the system favoured by Santos, the reigning Copa Libertadores champions, rather than the static system favoured by a few Serie A clubs. 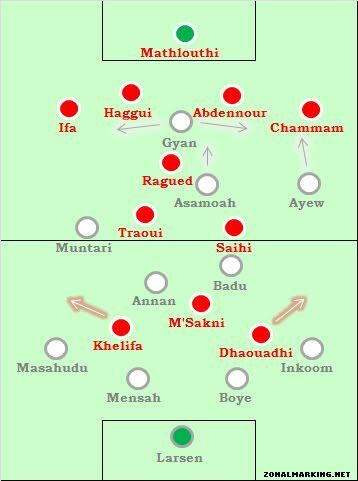 The key is the defensive responsibilities of the forwards – both Zouheir Dhaoudi and Saber Khelifa dropped to wide positions without the ball, sometimes forming a 4-5-1 with Youssef M’Sakni as the highest player up the pitch, then sometimes dropping into more of a 4-4-2ish shape, with one forward dropping back and the other remaining up top. 3. Tunisia also showed flexibility at the back, with the holding midfielder Hocine Ragued dropping between the centre-backs to allow it easy for Tunisia to play the ball out. Ragued’s willingness to come deep to collect the ball meant he was able to play more passes than any other player. 4. It was odd that Sami Trabelsi decided to change the way Tunisia played midway through the first half. M’Sakni went from the centre to the right, Khelifa from the left to the right, and Dhaoudi from the right to the left. It disturbed the rhythm of the side after a decent opening, and Tunisia went on to have only two shots on target in 120 minutes, a terrible record considering they marginally dominated possession. 5. Bizarrely, the player on either side that completed the most passes into the opposition third of the pitch was the holding player – Ragued and Anthony Annan. It demonstrated how difficult the sides found to play the ball forward and involve attackers in the build-up play. 6. The majority of the game was simply a struggle to find any players in space in attacking zones. Both defended with numbers and matched each other in midfield. 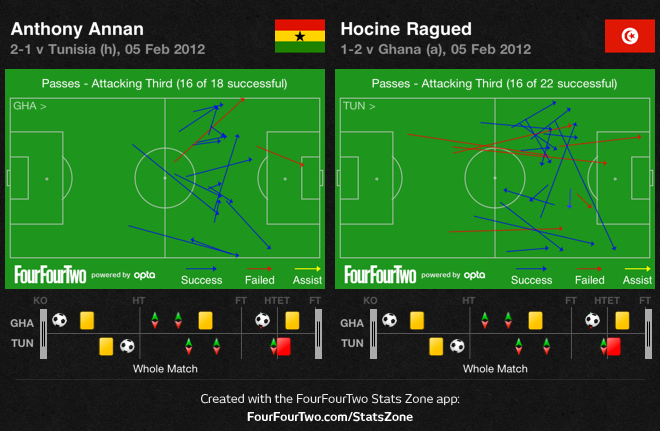 With the Tunisia forwards moving out to close down the Ghana full-backs, they didn’t get much freedom on the ball either. In theory the Tunisia full-backs were afforded more time on the ball, but the technically better Khalil Chammam had to watch Andre Ayew (though he still did get forward a bit), while right-back Bilel Ifa was less comfortable on the ball. interesting theme on a lack of creativity, coincides both with the ivory coast piece and a conversation me and my friend had about truly great african playmakers. Of those mentioned i don’t think jay jay okocha truly had the top class pedigree of the more typical european playmakers; he represented midtable teams, or powerhouses in weaker leagues (Fenerbahce and a then an ailing paris st germain). Abedi Pele seems to fit more, but even then i don’t believe he stands alongside the very best. This rambling introduction ultimately leads me to the name Kevin Prince-Boateng, and his decision to stand down from national team duty. He is a creative and highly energetic midfield player who’s style could rightly be characterised as hyper-active. He isnt a typical playmaker, his credentials definitely don’t stand up against the likes of xavi, iniesta, zidane, hagi, laudrup et al, but whose do? Somebody else commented that seydou keita is expected to adopt a more creative role than usual as mali have a stock of defensive midfielders. At this level would Boateng make an acceptable playmaker? I believe so, his sheer enthusiasm would carve out more chances, and he does possess good technical abilites. Against tougher opposition he could not be a pure playmaker but he does possess the characteristics, although they are slightly diluted. Hmm… I am not so sure. In Seria A, his dynamism is in general a contrast to the other players surrounding him, and is an asset to his game. Here, in ACN, suurounded by other dynamic players, he will have to rely more on his playmaking prowess, which as you correctly pointed out, is not of the highest qaulity. Best creative African player? Younes Belhanda in my opinion. I understand the angle here, but these players simply aren’t on a par with their european or south american superiors. They are African playmakers, but if they were of the standard we are talking about earlier in this debate, then they surely would have been involved with top level european clubs as most of the best inevitably do. Last time a young african playmaker that emerged was john obi mikel if i remember it right and you know what happened to him. Generally i think european coachs don’t trust african players technical abilities and they opt to chose them for their physical superiorities. do you have any plans of doing any games from Futsal EURO? Or writing about futsal at all? ZM What did you think of darragi’s impact on the game? In Derek Boateng Ghana have a player on the bench who could add the vision and technical ability to pick some incisive passes. Individually he is somewhat weaker than the current starters but it’s hard to see how Muntari benefits the team beyond the occasional scorcher from distance and frankly in most games the same applies to Kwadwo Asamoah, although he seems more comfortable in the less prominent roles the focus on Kevin-Prince Boateng at the World Cup and Andre Ayew at the ongoing tournament allowed him. If you already have a very functional midfield and backline adding more functional midfielders yields diminishing returns, both Muntari and Asamoah show the skills and ingenuity they possess far to rarely. The manager prefers them over Boateng though and while it’s somewhat difficult to ascertain just how much credit he deserves for Ghana advancing to the semis he certainly seems to know what he is doing regarding personnel selection and where he wants to go with the team, unlike some of his predecessors in the recent past. Looking to the near future there probably is a structural change to more of a 4-3-3ish shape on the cards anyway. If Kwadwo plays deeper with Boateng then we can play the ball forward better. While that’s true it would require dropping Annan, Badu or even both and that would be quite difficult to justify under any circumstances. The latter in particular is one of the stand out players of the tournament so far. In the semi final leaving either of them on the bench would probably be suicidal in fact. The Zambian attackers thrive in space between the opposition’s lines and will be looking to move in behind Ghana’s midfield. It will take discipline and focus to keep that space as tight as possible and sweep up through balls directed at Katongo, Mayuko and Kalaba, the duo of Annan and Badu are just perfect for that job. Also means Muntari should not start though, while his overall work rate is fine he tends to get lost for a couple minutes at a time regularly. Post should be titled ‘6 points on Tunisia’s losing team’ because even though they were losers in this game that is all this article focused on. African Football Rising Up exactly. 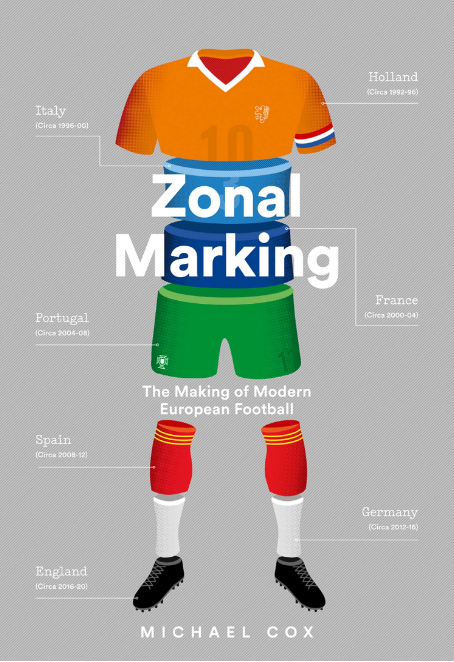 Zonal Marking would you say my team Zambia has a chance of beating this Ghana team?What do you think of the Zambian style of play?What’s your take on Kalaba and Mayuka? The biggest dissapointment for me was Kwadwo Asamoah, again. Seeing a player with as much all round ability as him – fast, durable, intelligent, able to tackle, shoot and pass very well – consistently have so little impact on games is starting to get frustrating. Advanced midfielder isn’t his best position but imv he’s been middling for Udi over the last year in a more traditional midfield role too, as good as they’ve been. When he broke through as a 20 year old it would have been justified to expect him to become a top class midfielder at least, but he’s not pushing on. He’s clearly valuable in terms of having the talent to play in positions but he’s unable to stamp his foot down on games like many of the best midfielders start to at his age. ZM what do you think is stoping him? Do you think his versatility has been a hindrance to him developing in a way, or is it some lack of ability on his part? Would be a real shame to see him become a “jack of all trades”. To be fair he has done a lot better for Ghana on the few occasions he was allowed to drop to central midfield and play alongside Annan ( pretty much exclusively, I don’t recall any matches he partnered with anyone else there ) rather than as the sole creative focus of the side. Providing no answer for the loss of Stephen Appiah probably has to be considered the major failure of Claude LeRoy and Milovan Rajevac as Ghana managers and that issue drags on to this day. Expecting Asamoah to the fill void was putting too much pressure on the shoulders of the young guy, while he clearly is a gifted footballer he lacks Appiah’s maturity and vision as a player and his massive influence as a person, which can not be overstated. From what I’ve seen so far Stevanovic is following a more holistic approach and tries to establish a more fluid playstyle rather than putting pretty much all responsibilities for the offense on the shoulders of a central attacking midfielder and Asamoah Gyan, even though designing everything around Andre Ayew might be tempting. Anyway, word from the camp is that Badu isn’t fit and will have to sit this one out, supposedly he’ll be replaced by Derek Boateng. We’ll probably see a better transition from defense to attack but this should also make things a lot easier for the Zambian attackers. I wouldn’t be surprised to see a much more entertaining game than we’ve come to expect from this Ghana side.